/shazam-wonder-woman-and-a-flash-green-lantern-team-up-movie-coming-soon/Last week, Nikki Finke returned to the movie beat with a huge scoop on Warner Bros. and DC Comics' impending movie plans, offering up their entire slate throughout the rest of the decade, which will be announced officially at Comic-Con 2014. Now, appearing on one of his many podcasts, director Kevin Smith, who is close personal friends with Batman himself Ben Affleck, has confirmed that this future line-up is exactly what he's heard is happening. "So do I. Yeah. I can't tell you man. I know people. I'm not allowed to say, but they showed me. I talked a while back about this universe that they are putting together. I looked at [this] list, and yeah, that's what I heard. This is what I was told. Nikki Finke claims that Shazam! and Sandman, two movies that do not apparently tie into the Justice League movie, will be released in 2016, quickly following Batman v Superman: Dawn of Justice. 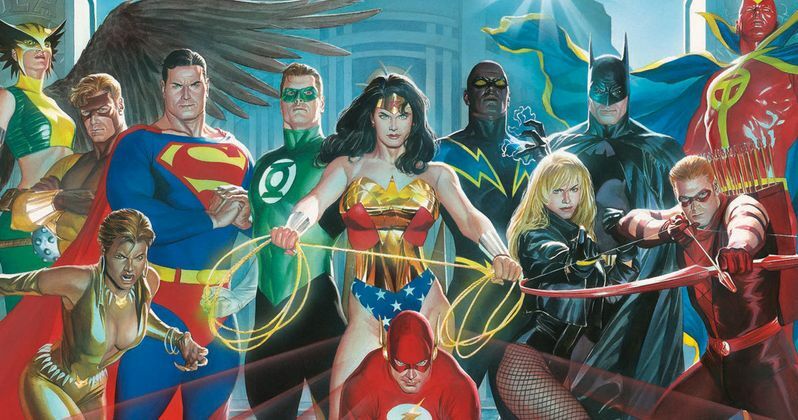 In 2017 we'll first get Justice League followed by the long rumored Wonder Woman stand-alone adventure. The same year, we'll also get The Flash and Green Lantern team-up movie. And then in 2018, we'll get a true Superman sequel with Man of Steel 2. Many have scoffed at the ambitious nature of this impending line-up of films. Is it possible that director Zack Snyder will be able to make 3 movies back-to-back so quickly? And what about the actors being asked to make so many movies in this short amount of time? Just how far along are the movies in the planning stages? Will we actually see this come together? We'll have to wait until Comic-Con 2014 to find out if this is truly official or not.